This work has been produced by the Australian Council for Educational Research (ACER) on behalf of the OECD. Funding was provided through the OECD. The Programme for the International Assessment of Adult Competencies (PIAAC) is an international assessment of the proficiency of adults (aged 16-65 years) in key information processing skills (reading, numeracy and Problem Solving in Technology-Rich Environments). The PIAAC Survey of Adult Skills has revealed that a considerable number of adults in OECD countries possess only limited literacy and numeracy skills. The OECD is currently reviewing the content of the frameworks and cognitive assessment instruments for the 2nd cycle of PIAAC ready for delivery in 2021-22. This report is the result of a review of the numeracy construct and assessment in PIAAC. It recommends a range of areas for potential improvements and enhancements, including of the definition and elaborations of adult numeracy used in the framework, and the assessment content. Many of the suggestions arise out of the concern that the existing framework and assessment do not reflect some of the realities of the skills and knowledge adults now need to succeed in work, life, and citizenship in the 21st century. The report also recommends the development of a PIAAC numeracy components assessment, which would have parallel aims to the existing reading components assessment, and provide insights into the skills and knowledge of the significant number of adults with low levels of numeracy. Tout, D., Coben, D., Geiger, V., Ginsburg, L., Hoogland, K., et al. (2017). 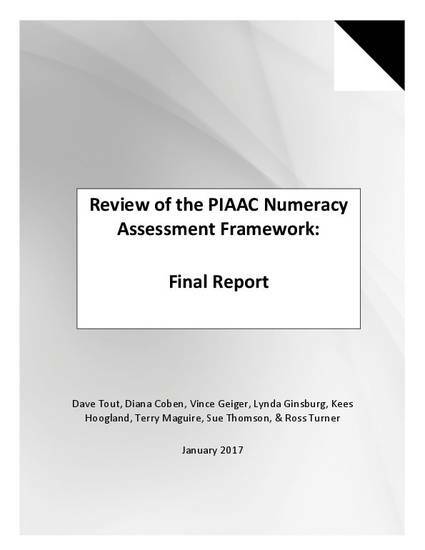 Review of the PIAAC Numeracy Assessment Framework: Final Report. Camberwell, Australia: Australian Council for Educational Research.